Our mission is to put a smile on your face and a lift in your stride. 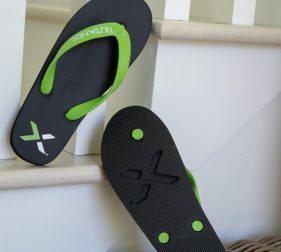 Our flip flops and footwear are meant to promote your brand, promote your uniqueness, and keep you comfortable all at the same time. Neet Feet®, it’s a way of life. Neet Feet® custom flip flops make the perfect promotional product to promote your business. 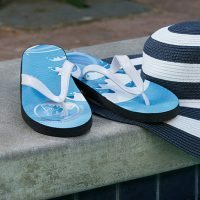 Since 1987, Neet Feet® has been supplying the finest quality custom logo flip flops, sandals, slippers and rain boots to Fortune 500 corporations, upscale hotels, sports teams and schools and a variety of other customers. These clients know the value of quality promotional products and their ability to connect with consumers, raise corporate awareness, increase brand loyalty, and enhance personal experiences. Created specifically for each promotion, the design possibilities are infinite. Our graphic experts are happy to help with a custom design that will increase the visibility of any business. Print a photo or a logo, select sole and strap colors and produce unique, one of a kind footwear. Promote a business with every step! Leave a company name, tagline or logo in the sand. Neet Feet® invented and introduced the world-famous die-cut “Logo Footprint” flip flops that leave an imprint in the sand. 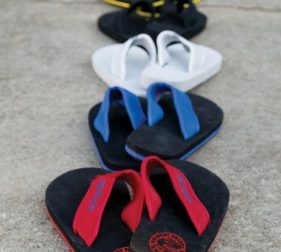 No other supplier offers better quality custom logo footwear, flip flops and sandals than Neet Feet®.